The classic checkerboard home kit is updated for 2016. 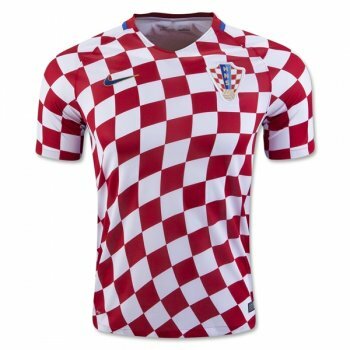 For the Euros, Croatia will wear a jersey inspired by one worn in the 1998 World Cup that also took place in France. Accent color navy is featured around the collar, on the stripes running down the sides, and on the embroidered Nike swoosh. "CROATIA" is screened on the back collar. Sewn on team badge. Dri-FIT technology for moisture protection.